We'll give you a hint: electricity. It may sound too early, but Volkswagen is already hard at work developing the next-generation Mk8 Golf GTI. We know that the Volkswagen Group is attempting to move away from the Dieselgate scandal, and part of this includes a large variety of electric vehicles. The ID Concept previewed what VW thinks its EVs could look like, but the brand obviously won't stop at only one model, and will also embrace electric technologies, including the next Golf GTI. Don't panic because, according to Autocar, the 2020 GTI could be a hybrid. The Mk8 GTI will be a mild hybrid, rather than a full hybrid like a Toyota Prius. The whole Mk8 Golf lineup will receive a 48V electrical system and integrated starter motor, a similar system that is used in the tri-turbocharged Audi SQ7 SUV. Basically, this technology replaces a conventional gas-driven turbo with an electrically operated compressor. This means that the engine will have better low-end response and a broader torque curve. 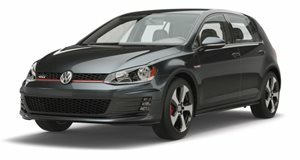 In addition to being more responsive and more efficient, the new Mk8 will be the most powerful GTI yet. Although the car is still around three years away, Volkswagen research and development boss Frank Welsch is targeting around 261 hp. This is the same amount of power that's found in the limited-edition GTI Clubsport, which set a FWD record around the Nurburgring. That is also more power than the Mk6 Golf R had from its 2.0-liter engine. The Mk8 GTI should be available with either a six-speed manual or seven-speed dual-clutch, and will also gain a cool electric-boost mode that will make it even faster in sport mode. For once we aren't depressed to hear that a sports car is going hybrid. In fact, this new GTI should be pretty amazing. We can expect to see the Mk8 GTI revealed for Europe in 2019, but as we have seen in the past, it may take some time before the car arrives at US dealerships.